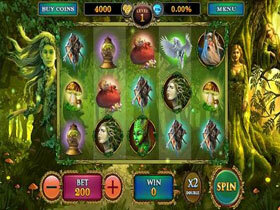 Fairy Magic is a Video Slot consisting of 5 reels with 15 Pay lines and has a wonderful magical fairyland theme. This slot has high quality graphics with icons that animate every time a winning combination is formed. A good example is when the Fairy waves her wand and drops a star below the reel. There is soothing background music playing while players browse through the information. Fairy Magic is the newest additions to the Playtech family that is loaded with an interesting Free Spins round as well as a cool Gamble Feature that allows players to earn some extra wins. 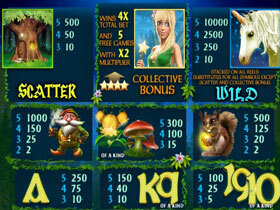 Fairy Magic slot has more than 32 winning combinations with various winning symbols such as the Unicorn, a Tree House and a Fairy. Other paying symbols are the Gold Nut, Mushrooms, Flowers and high valued symbols of playing cards. Fairy Magic offers a Bonus feature called Collective Bonus. Whenever the Fairy appears on any reel she will drop a star, and you need to collect 4 of them to trigger the Collective Bonus game. This will give you 4x your total bet and 5 Free Spins with 2x multipliers. Fairy Magic has a simple optional Gamble Game where you can stake your current winnings and guess the colour of the next card drawn. If you guess correctly your winnings will be doubled, but if you guess incorrectly you will lose your winnings. The coin betting range is from 0.01 cents to $0.25 and you can play up to 200 coins maximum bet per spin.